The performance of commercial diets used to raise fish can vary substantially due to differences in manufacturing methods and ingredient source and quality. Performance measures of a diets include growth rate, feed conversion efficiency and faecal discharge characteristics. Three different commercial diets have been used to raise yellowtail kingfish in New Zealand (as of late 2000's), but no data has been available on the performance of these diets for this species, as the diets were primarily developed for salmon. We undertook a study at the NIWA Bream Bay Aquaculture Park to provide farm managers with some independent data they can use to assess the economic and environmental performance of commercial diets for yellowtail kingfish aquaculture. Yellowtail kingfish were raised in tank from 0.4-1.2 kg and fed three diets. The nutritional and physical properties of the diets are shown in the following table. The protein, ash (fibre) and lipid and density properties of the diets differed considerably, which would be expected to lead to differences in the growth performance of the fish. The fish were raised for 114 days over the spring and summer months. The table below shows the growth and feed conversion data. Growth and feed conversion were poorer in the colder spring period compared to the warmer summer period. There were differences in growth rates among diets in the spring period, but not in the warmer period. Despite substaintial differences in the mass and volume of pellets ingested per meal amongst diets, the amount of protein ingested per meal was similar. This suggests that the yellowtail kingfish may eat as much food as is necessary to meet a certain protein threshold. The type of diet has a strong influence on the amount of settleable solids excreted by fish. The total nitrogen and phosphorus content of the settled solids were also very different. This information can help in the assessment of the environmental impact of different diets for sea cage farming of yellowtail kingfish. 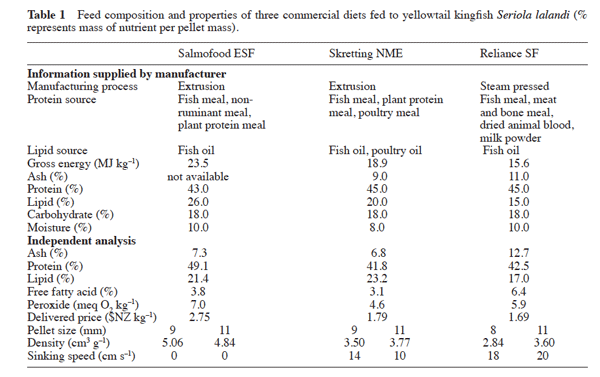 The commercial diets that have been used to raise yellowtail kingfish in New Zealand to date (2009) vary considerably in composition and result in substantially different feed intake amounts, feed conversion efficiencies and faecal output. Moran, D., Pether, S.J., Lee, P.S., (2009). Growth, feed conversion and faecal discharge of yellowtail kingfish (Seriola lalandi) fed three commercial diets. New Zealand Journal of Marine and Freshwater Research 43:917-927 (Open access publication - click on link). This research was funded by the NZ Foundation for Research Science and Technology, and was carried out during my employment at the NIWA Bream Bay Aquaculture Park.